As it stands, New Year's Eve already is a glamorous holiday filled with sparkles, elegance, and celebration. Megan and Lane decided to take it to the next level and plan the happiest day of their lives around this festive holiday. These two have been in love for as long as I can remember--seriously! The three of us graduated from high school together, and I can't remember a time when they weren't together. Knowing these two outside the photography world made their wedding even more special to be a part of. 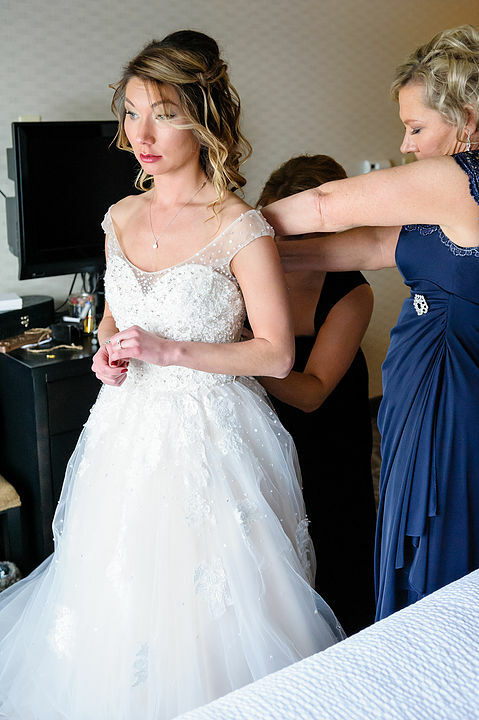 Megan wore the most amazing Madeline Gardner wedding gown I've ever seen. It exuded elegance, just like her opal engagement ring. She surrounded herself with the most amazing women she knows, and they kept her laughing and relaxed all day. 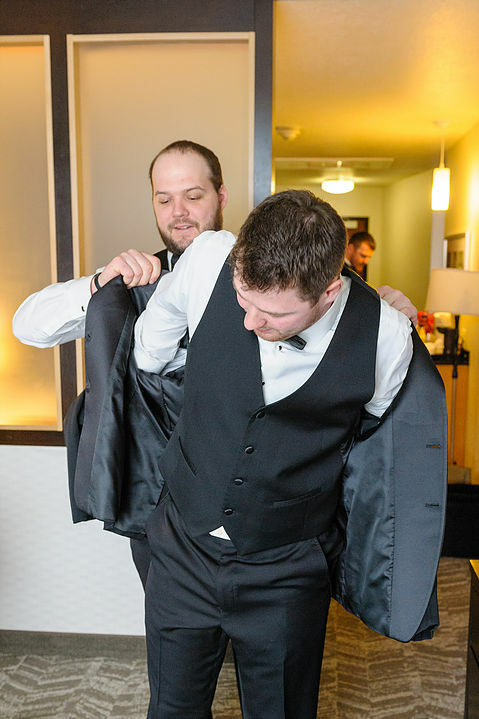 Lane and his groomsmen relived the fun of the night before while getting ready in their hotel suite, drinks in hand and laughter bouncing off the walls. To my delight, Lane and Megan shared a first look before their ceremony. They couldn't take their eyes off of each other as they flirted and kissed in the hotel lobby. Suddenly, it was time for everyone to pack up and head to Green Bay Distillery for the big event! The front hall was tastefully decorated with sweeping linens and floral decorations. An intimate ceremony made way for the last party of the year. The reception hall in The Distillery was transformed into a New Year's Eve reception dream. Black linens accentuated metallic touches, and floral arrangements were glowing under candlelight. The bridal party couldn't wait to toast the newly weds, who soon after shared their first dance as husband and wife. Once the dancing started, Megan and Lane hardly left the dance floor. They gazed at each other, held each other close, and belted out Meatloaf lyrics like there was no tomorrow. I have no doubt that they partied the night away well past the countdown at midnight. Megan and Lane, it has been such a pleasure getting to know the two of you and your relationship even more than I did before. Your lighthearted, but deep-rooted, love for one another is so inspiring and I am so thrilled that you two have made it this far. There's something special about high school sweethearts, and I wish you two many decades of happiness. Thank you for letting me take part in your journey.